Pitta dosha is made up of the elements of fire and water through which it manifests the qualities of pungent, hot, penetrating, oily, sharp, liquid, spreading and sour. Its primary function is transformation and is the force of metabolic activity in the body associated with the endocrine function, digestion, body temperature, visual perception, hunger, thirst, and skin quality. In Western terms we can categorise the activities of pitta in terms of amino acids, enzymes, bile, hydrochloric acid and hormones. This explains the seemingly contradictory combination of fire and water to form pitta. 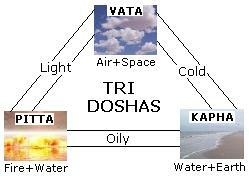 Pitta exists as water or oil in the body, thus preserving the tissues from the destructive aspect of fire. It resides in the eyes, blood, sweat glands and lymph but its primary site is in the small intestine. Mentally it plays a role in understanding, in digesting sensory impressions. • Your skin is overly oily and prone to acne. • You have excessive hunger or thirst. • You sweat profusely and have overly hot hands and feet. • You suffer from infections, access acidity, ulcers and heart problems. • You are overly aggressive and prone to anger and frustration. • You experience lose or hot, watery stools and diarrhoea-type elimination. • You tend to be overly critical, domineering, obsessive or controlling in nature. • You experience frequent eyestrain or tension headaches. • You are going prematurely grey or balding. •Avoid hot substances such as red meat, alcohol and tobacco. • Avoid excessive fasting and try to eat when you are hungry. Don’t skip meals; especially lunch. • Exercise moderately (short runs or swims) and only when the weather or climate is cool. • Walk regularly in nature; especially by the sea. Walking in the moonlight is also very beneficial. • Especially avoid prolonged exercise in very hot climates or environments. • Keep your head and skin protected and refrain from sunbathing when the sun is hot. • Reduce your exposure to hot environments such as saunas and steam rooms. • Cultivate peaceful emotions and spend more time with people who love and fully accept you. • Avoid and angry or stressed people and try not to argue – aim to agree more often! • Take the time to be sweet and sociable and find the time to chat, laugh and play. • Practice moderation and find time for enjoying leisure activities and appreciating natural beauty. • Avoid overly competitive sports, deadlines and confrontation in general. • Practice meditation, cooling forms of pranayama and gentle yoga postures. • Avoid watching too much television and excessive use of computers. • Massage the head with coconut oil at night. • Wear cooling colours – blue, purple, green and avoid wearing red colours. • Drink pomegranate juice or eat pomegranate seeds. Its astringent and bitter quality helps balance pitta, cleanses the liver and blood and works as an excellent heart tonic. • Drink 30mls of Aloe Vera each morning. • Generally favour warm or cool and refreshing foods with the tastes of sweet, bitter and astringent such as; asparagus, lettuce, broccoli, cucumber, raita, mung dhal, summer squashes, courgettes, cilantro, coconut, cucumber, lime and green salads. • Avoid very oily, salty, sour, fermented or pungent foods and spices such as chillies, alcohol, pickles, vinegar, hard or pungent cheeses, citrus fruits, sour cream, yoghurt, tomatoes, garlic, onions and chillies as they will aggravate the acid and pitta in the intestines and blood. • Enjoy sweet, juicy seasonal fruits such as peaches, figs and berries. • Avoid red meat and favour chicken or fish. • Most vegetables, beans and lentils are good unless they are cooked with too much oil. • Favour wheat, basmati rice, oats and barley and take corn, millet and rye in moderation. • Drink cooling herbal teas such as peppermint, spearmint, rose, coriander or liquorice. • Ghee is cooling and can be used for cooking and spreading on toast. Coconut oil can also be used for cooking whilst Udo’s oil, flax oil or pumpkin oil can be used for salad dressings. • A nourishing breakfast to balance pitta could include cereal, toast and apple juice. • Japanese and Chinese type foods and salads are generally good for pitta digestion. • Always avoid over-eating, especially in the evening.